Co-developers Ledcor Properties Inc and Anderson Pacific LLC, and with their partners Qualico and Lantower Residential, have broken ground on Shoreline Gateway, a 35-story, mixed-use luxury apartment complex in Downtown Long Beach. 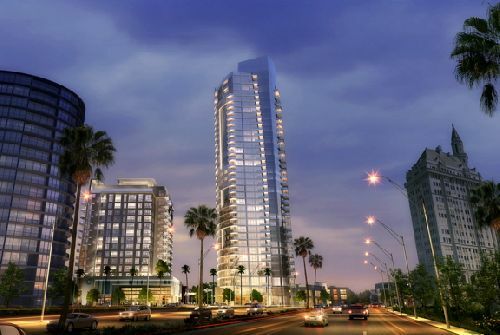 Shoreline Gateway is the companion building to “The Current” –– a 17-story, mixed-use, 223-unit luxury apartment tower on Ocean Blvd in Downtown Long Beach. Shoreline Gateway is scheduled for completion in Q4 2021. The highly-anticipated project will feature 315 ultra-luxury residential apartment homes, along with approximately 6.5k sf of commercial space, five levels of subterranean parking, myriad amenities and community living spaces. Residents will enjoy a soaring community room on the 34th floor offering sweeping 180-degree panoramic views of the Pacific Ocean, the Downtown Long Beach skyline and Orange County. One level up, the 35th floor is home to a shimmering rooftop pool, spa and dining and entertainment deck. Additional entertainment space is found on the third floor, which features a dining and fire pit lounge overlooking the ocean, along with a large fitness center, pet spa and creativity studio. Shoreline Gateway will be connected to its sister property, “The Current”, via a 10k sf shared plaza activated with premium retail, resident amenities and world-class art by Jud Fine and Barbara McCarren, which reflects the city’s character. The tower will include a mix of studio, one-and-two-bedroom apartments ranging from 580 sf to 2.5k sf in size and two-story penthouses on levels 34 and 35. The design team consists of Studioneleven (Design Architect), Carrier Johnson + Culture (Architect of Record), RELM (Landscape Architect), Englekirk (Structural Engineer), and C&V Consulting (Civil). Build Group is the General Contractor. Shoreline Gateway is the first LEED-ND (Neighborhood Development) Gold project in the City of Long Beach, with its companion tower, The Current, which was the first LEED-NC (New Construction) Silver residential tower in Long Beach, built in 2016. The Shoreline Gateway campus started in 2004 with a strong vision that the project would be a catalyst for the area––a walkable, iconic gateway to Downtown, with green and unique spaces, sensitive to the waterfront and environment. Over a decade in the making, The Current celebrated its grand opening in 2016, marking the first ground-up high-rise to be built in Long Beach since the Great Recession, and the first apartment tower to be developed in Long Beach since 1966. Today, as Downtown Long Beach continues its stunning renaissance, Shoreline Gateway is expected to be a major component in the city's evolution and success.